Important freshwater habitats in the country are the highland forests and wetlands (both forested wetlands and water bodies such as rivers, lakes and lagoon). Forests in the highlands, often referred to as natural ‘water towers’ because of their water catchment function, help provide us with continuous clean supply of water. They are the source for most of the country’s water resources. Wetlands provide a range of natural ecological and hydrological functions therefore they have important roles in water supply, water purification and flood control. In addition to the functions that relate directly to providing freshwater resource, both the highland forests and wetlands also contribute many socio-eonomic benefits in terms of the goods and services (such as forestry and fisheries resources) and they are also critical biodiversity conservation as they provide refuge for many species of plants and animals. Forest areas within the Permanent Reserve Forest (PRF) particularly those in the highlands that have been identified as critical for ensuring continuous source of water are categorised as protection forests. Water catchment forest constitutes one of the ten classifications under the protection forest category. Designation of forest as catchment forest helps safeguard the quality as well as availability of water and rivers in PRF. A number of state governments have taken steps to gazette their PRF as water catchment forest. For example, as of 2004, the Pahang state government has gazetted a total of 287,077 ha of its forest reserve as water catchment area while the state governments of Negeri Sembilan and Selangor have approved the gazettement of 43,678 ha and 51,020 ha of their PRF as catchment forests respectively. The other states in Peninsular Malaysia are in the process of gazetting the identified areas within their PRF as water catchment forest. Overall, about 18.8% (i.e. 880,538 ha) of the total PRF is identified as water catchment forest. 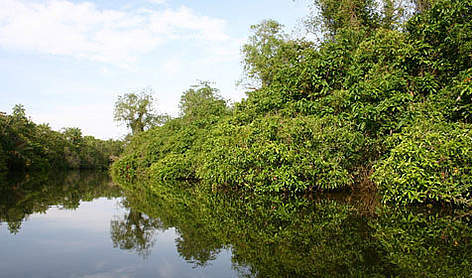 Malaysia has about 3.3 million ha of forested wetlands, which is equivalent to 10% of the country’s land area. As of 2002, 3% of these are mangroves, 7.2% peat swamp while freshwater swamps and other marsh areas make up 2.5% and 3.5% respectively. Freshwater swamps and peat swamps are the most threatened wetland habitats. As a signatory to the Ramsar Convention, a global intergovernmental treaty established in 1971 concerning the conservation and wise use of wetlands and their resources, one of Malaysia’s obligations is to designate wetlands of international significance as Ramsar site within the country. To date, five Ramsar sites have been designated in Malaysia. These sites are the Tasek Bera in Pahang, Pulau Kukup, Sungai Pulai and Tanjung Piai in Johor, and the Kuching Wetlands National Park in Sarawak. By designating the sites, the government is committed to take the necessary steps to ensure the maintenance of the ecological characters of the sites. Conserving the freshwater habitats ensures their vital hydrological and ecological functions are safeguarded for the economic and social benefits of the population. If priority is not given to conserve these habitats, there will be adverse consequences to our health, prosperity and well-being. This rationale forms the basis for WWF-Malaysia’s work on wetlands conservation in the Setiu Wetlands. Through our demonstrative field project in the Setiu Wetlands, we promote the conservation, integrated management and sustainable use of the various freshwater habitats in the wetlands that emphasise on stakeholders’ partnership and the need for appropriate tools to support the management including conservation of wetlands.